One of the classic questions in the Pique’s Best of Pemberton survey (now underway) has been “where do you get the best view of Mt Currie?” I suspect they took the question out because everybody said, “from my living room” – the truth is, there isn’t a bad view of Mt Currie, and that’s one of the defining things about living here. That’s why I was so excited to stumble upon this amazing story from local photographer Dave Steers on his flickr page. One of the best things about living in Pemberton is Mt. Currie. It’s one of the biggest mountain in this area. There are very few places from the town, up the Meadows, or over towards the New Site, that it cannot be seen. It dominates the southern horizon. The north face seems to drop straight into the valley from the peak. It’s easily seen from much of Whistler even though it’s some twenty kilometers distant. Just look north. It’s aspect changes as the light changes. It is beautiful. It is mesmerizing. Mt. Currie is 2,596 meters or 8,517 feet high. It rises 2,300 meters or 7,546 feet above its base. What’s rather amazing is that Mt. Everest, while it is 8.848 meters or 29,029 feet high and consequently a whole lot taller, rises only 3,500 meters or 11,483 feet. Thus Mt. Currie’s rise is over two thirds that of Mt. Everest! The relief, the difference in height between the bottom and top, of the Coastal Mountain’s is among the highest in the world. Pre-empting was how land was acquired; it meant driving corner posts, or staking, around the acreage allowed, and then recording the pre-emption with a magistrate. The pre-emptor had to live on and improve it, have it surveyed, and eventually pay for it at the staggering rate of $1 an acre. He then received a Crown Grant. The land at the foot of Mt. Currie was some of the first privately held land on the mainland, desirable because it was on the original Gold Rush trail. During the gold rush days tomatoes were selling for as much as seventy five cents and cucumbers for a dollar. In 1859 one settler cleared over 240 pounds sterling an acres growing potatoes. Farmers were making money. Then the Cariboo Road up the Fraser was completed in 1863 and the exodus from Pemberton began. By 1874 only a few settlers remained. There would be a second wave and John Currie would be in it. 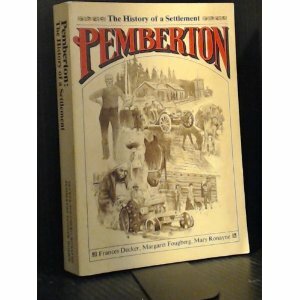 He moved to Pemberton where his family finally found him, some forty years after he left home. In 1893 his step-mother Janet Currie arrived in Pemberton with her son Ronald Currie and daughter Annie McIntosh. Janet didn’t think much of Pemberton and quickly moved on to Lillooet. Around 1895 another sister came to live with John, bringing three daughters with her. Ronald later returned and operated the Halfway House on the Portage and ran a stagecoach service until 1913. In 1895 the federal government established a post office on John’s farm to serve the settlers in the Valley and over the Pemberton Portage. Currie was the postmaster handling the mail and operating a store in a little log building on his farm. The Curries had three children, two sons and a daughter. The trail from Squamish led travelers right past the Currie’s door. John would often welcome them and invite them to spend the night. The hardwood floors in the cabin were made from a steamer abaandoned on Lillooet Lake. Currie’s grazing land stretched down to the Green River and over to the mountains on the west side of the Valley. By 1891 he had one hundred cattle and six horses. In 1897, after his herd had grown considerably he decided to drive them over the trail to the Howe Sound, intending no doubt to send them by ship to Vancouver from there. He hired dozens of men from the Indian Reserve to help with the drive, but the cattle weren’t used to being herded and refused to stay on the trail. Currie tried fencing in sections of the path but the animals again refused to be driven. Currie reluctantly gave up but because he had not stored sufficient hay, because he wasn’t expecting to have any cattle over the winter, few of his herd survived the hard winter of 1898. In 1901 John resigned as Pemberton Meadows postmaster and not much later Leonard Neill took over the farm. Currie moved away and in 1910 died and was buried in Vancouver. I don’t know what the stone above his grave looks like, but just south of the little town of Pemberton the man has one hell of a monument. Lil’wat storyteller, Marie Joseph Abraham then added a little more historic information, which makes me love that peak even more, for what it represents to us living here in its shadow – hybrid histories of two different cultures coming together in one outstanding landmark. John Currie’s wife was Saraphine Currie, she came from Lilooet, (Fountain–Xaxlep’) that was where her parents came from. They were St’at’imcet/ Shuswap people. Our grandmother was their daughter Josephine Currie/Joseph/Tom. They had 4 children Christine Joseph, Joe Joseph III, Sam Joseph, and their youngest Adeline Joseph Peters. Her husband Joe Joseph II died, so later she made her way back to Lillooet. Josephine married again, so she became Josephine Tom (Saopin) to most people. She lived to be over 100 years old. Our Dad was Joe Joseph III, he wasn’t even her oldest child, Christine was, but she died in 1918 when that awful flu was going around the world killing people. Their father died too Joe Joseph II in 1918.
please make a request to put back the original name on the maps as Tzil….. Thanks for your suggestion, Vern. I think that request has to go to the provincial department that register names. I need to look it up. But that could be a powerful community project – to gather letters of support to advocate for that change. A worthy 2018 resolution? Vern, that’s fantastic to hear. Perhaps we can connect about how it was accomplished, and get a game-plan together.